Tolu Daniel works as an editor for two journals. Afridiaspora is a respected literary webzine that has also successfully branched out into publishing anthologies. Tolu also edits for a new journal that had its first issue recently in November 2017, The Single Story Foundation Journal. Tolu got into editing through his friendship with the founder of Afridiaspora, Nana-Ama Kyerematen, from Ghana. Tolu: “She was always telling me about how she feels my work would benefit if I read this or read that. After a while we started thinking about expanding Afridiaspora. “I told Nana-Ama, ‘Hey, I can do this thing. Let me work with these writers.’ It was like a mentorship thing with the writers. After a period it kind of stuck because I enjoyed doing it. It was really interesting to know that I could give suggestions about how a particular work might look and someone would take it seriously. I ask about his biography. 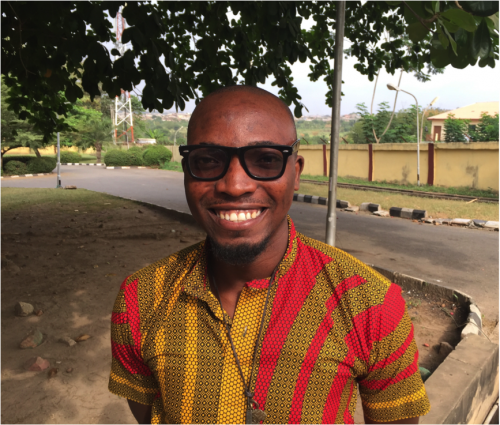 Tolu: “I actually live here in Abeokuta. I was born here. I’ve been attending Ake Festival since its inception. I’m always here. I call myself the unofficial host of the Ake Festival. “I get to see most of my friends at Ake, and we get to hang out and talk. I have also had the pleasure of meeting some of my literary influences here. I attended the Ake Festival masterclass, the first one that was taught by Lisa Teasley and Doreen Baingana. “I studied economics at Tai Solarin University of Education in Ogun state. Going to the school was not my choice, it was my dad’s. He wanted me to be close to him because he was working in the town. I had just finished secondary school, and I wanted to be at home with most of my friends. My dad wouldn’t have it. I didn’t do really well, but I graduated at nineteen. I just knew that everything I did there would not be useful in the future. 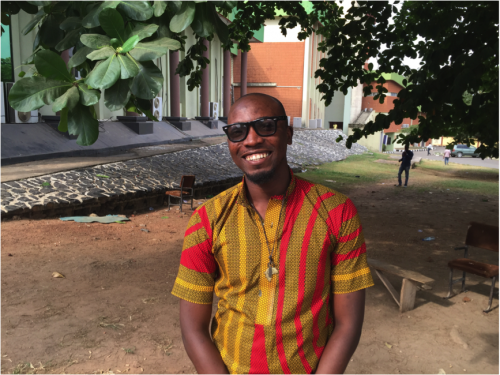 “In 2010 I came back to Abeokuta and my older sister started giving me books to read, because she reads a lot. I was frustrated with the environment so she felt, OK, if you had books to read, maybe you’d feel fine. She bought me all the Harry Potter books. After I finished the Potter books, I told myself, I’m going to write my own Harry Potter series. We talk about the voice in Junot Diaz’s stories, how they mimic Yunior’s way of speaking, and what is meant by voice. Tolu: “Last week I was in a poetry masterclass with Chris Abani, and one of my take-home points from that was the place of vulnerability in fiction and how if you are able to allow your vulnerability to seep into your work, it can help readers to connect to your emotional core. When you have a voice that is loud enough in your sentences, your readers will be able to connect, even if that is not your intention. We talk about an African voice and what it might be. We go on to talk about the Jalada language project, translating from stories that are written first in local languages. I praise Ken Saro-Wiwa for his writing. Tolu mentions a book that is written in a strong African voice, Fine Boys by Eghosa Imasuen. The novel he’s working on follows three different eras—the foundation of the Oyo kingdom and the kings. Tolu: “I’m trying to document history properly. I’m trying to talk about Oyo kings and the myths around some of them that are deified. I’m trying to make my narratives in different time lines to reflect the times and seasons. One is a pre-colonial era, there is a before Christ era, and there is now. Each of those things is going to be jostling together. It’s feeling like I’m pulling it off while I’m writing it. I don’t know if it will be as good as it feels in my head. “My Legendary Uncle and Other Awful Memories” published in The Wagon and online in the Nthanda Review. “The Unkindness of Ravens” published in Expound Magazine.